The strobe light portion of the test did not bother her at all but when it came to the blowing on the pinwheel, the wheels fell off the wagon :( I felt so sad for her. Since her lungs are already somewhat compromised, I figured this would be the portion of the test that would cause anxiety and it did. They try to force hyperventilation. She was labored in breathing when she had her seizure so I'm not surprised that this caused trepidation for her. She started to cry and stopped blowing the pinwheel and freaked out a bit. The nurse tried to get her to respond to some of her questions but Munni wasn't having any of it. She was upset, scared, clinging to my hand and it took a while to calm her down. We also finally got her surgery/MRI scheduled for December 4th. The scheduling people were awesome and able to get it scheduled for early in the morning so I won't have to deprive her of any food. This is a huge bonus for adoptive kiddos and a major answered prayer. 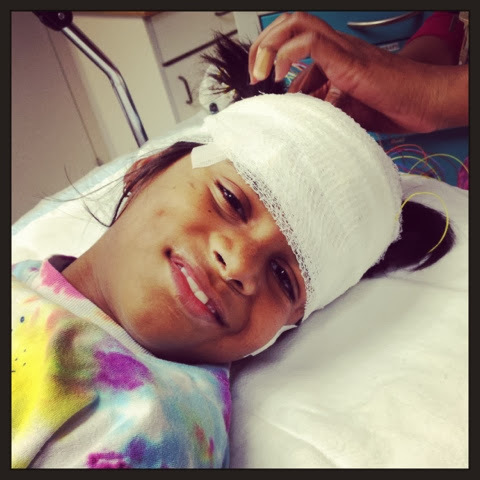 In regards to the EEG, I won't get the results for 7-10 days. I don't know how long after for the MRI but then we will have a follow up and hopefully it will all be good news. I would appreciate any prayers for Munni! On another note, my furnace went out and I had to replace it to the tune of close to $6k. This all happened right around the time my final installment was due for the first half of my payment to my agency. Let me pause for a moment and tell you that if you ever want to be tested and tried and have the most unexpected costs and repairs happen to you, start an adoption :) Throughout this journey there have been times when I've felt God tell me to cry out for help and times when I've felt him tell me to pray in secret. This was one of those times when I felt like he was telling me to just pull into his presence and trust in him and pray in secret. The deadline for the payment to my agency came and went and I didn't have the money. With everything else going on in regards to Munni, I didn't have enough energy to stress over it. I just kept praying. Last October I had major issues with my transmission and it turned out that Nissan was involved in a class action lawsuit because they installed the faulty radiator that leaked into the transmission of the Xterras and never issued a recall even though they knew. Those dirty dogs. The problem didn't kick in until around the 90k mark so I think they thought they would get away with it…. I guess they weren't banking on the fact that a lot of Nissan buyers (like me) bought with the intention of keeping the car for a lonnnnnnnnng time. Let me tell you, I LOVED my Xterra. It was my favorite car I ever had. So when all those problems arose I was highly ticked and even more so when the dealership wouldn't do anything. Well, I was contacted about the lawsuit, filled out the paperwork, and forgot about it. When we got home from the EEG, I grabbed the mail and we walked into the house. In the mail was a check from Nissan. Yep. I couldn't believe it. It was enough to cover my final payment for the agency fees and my immigration fees! God is so very good :) Of all days, that was the day I needed a miracle the most. Time and time again, God has provided. He has shown his favor and providence and proven to me over and over what is etched on my arm, "Is anything too hard for the Lord?" That verse was a cornerstone for me for Munni's adoption and continues to be one for R's as well. So that's where we are. I look at her and think about all that she's faced and accomplished since she came home and I am amazed by her. Oh, and did I mention that she got straight As on her first report card with no accommodations? I was really proud of her because she tries hard and wants to learn. I purposely did not put her in an ESL class. My thesis for my Masters degree was in second language acquisition so I have very strong thoughts on the topic :) She is doing great and learning in leaps and bounds. I thought she would be learning Spanish as her third language but instead she's learning sign! She had a hearing impaired friend in Hyderabad who was like a little sister to her and now in her class is a boy who is hearing impaired. She has learned so much sign I am in awe! One day after school I was picking her up from the center and the two of them were on the playground. She was holding his hand and they were signing something. I wanted to cry - It was the sweetest thing. Thank you for all your prayers for Sweet Munni, I appreciate them so much!! I keep thinking of something my son said when one of our pets was sick, and recovered: "God is right on time, as usual!" Love the story of your funding -- that happened to us time and time again during this adoption, when we were most strapped for fees (or when things broke down, just like in your case!). So thrilled to see how God has His eye on your sparrow! God is so good! He takes care of our every need, doesn't He?! I'm praying for both of your sweet and beautiful girls...and for you too! Praying for positive results for Munni's MRI. That poor girl has been through so much.. but God's plans for her are bigger than anything she's faced so far. As for grants, message me and I will share the two that gifted us with very generous grants. We were immensely blessed! I love reading how God is providing for those that step out in faith to adopt. I can't tell you how many times I've thrown out those class action lawsuit letters. I'm going to start filling them out from now on! If nothing else, adoption does teach you to trust that what is right will be done. So glad to hear that my theory about this continues to reign true in your journey too. Trust, when the mountains seems so high is hard, but such a valuable lesson learned. Thrilled that things continue to move forward for you and for Munni. I totally missed this post. She is sooooo cute looking in that picture. And I am just in awe of God's provision. Loving it!!!!!! !